I am hoping the photo comes up with this post – things are not right, but Nathan is otherwise occupied so we will carry on, and he may have to fix things later. A little while ago I did a youtube video on how I colour my stamped images, and this is the stamp I was colouring with distress inks, and what happened to it after the camera was turned off! I had a couple of coloured images so I cut into one of them to create a 3d topper, and then matted it onto Stampin up cardstock – Wisteria Wonder and Pink Pirouette. The embossing folder was Craft Concepts Cottage Florals, the stamp was Kaszazz Large Fuschia stamp and I finished of the card with some ribbon and perfect pearls.Must go as tea is ready, til tomorrow…. 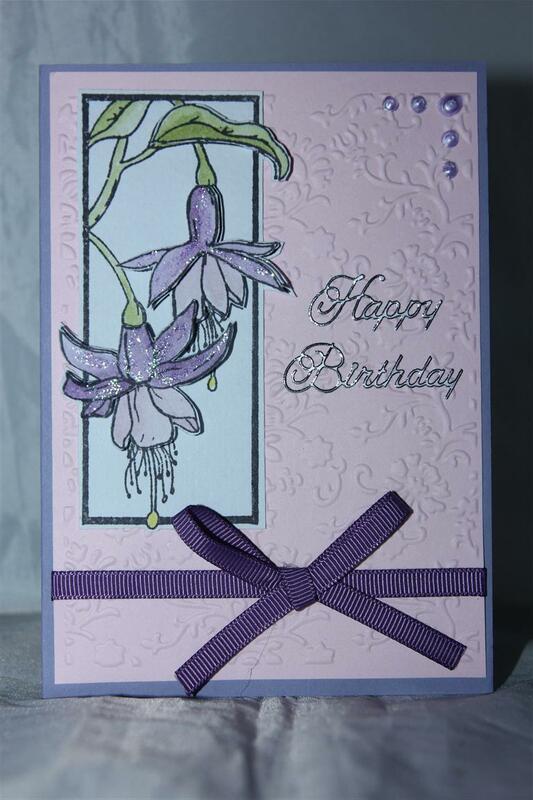 Here is card number 2 using my new stampin up stamp set – Field flowers. 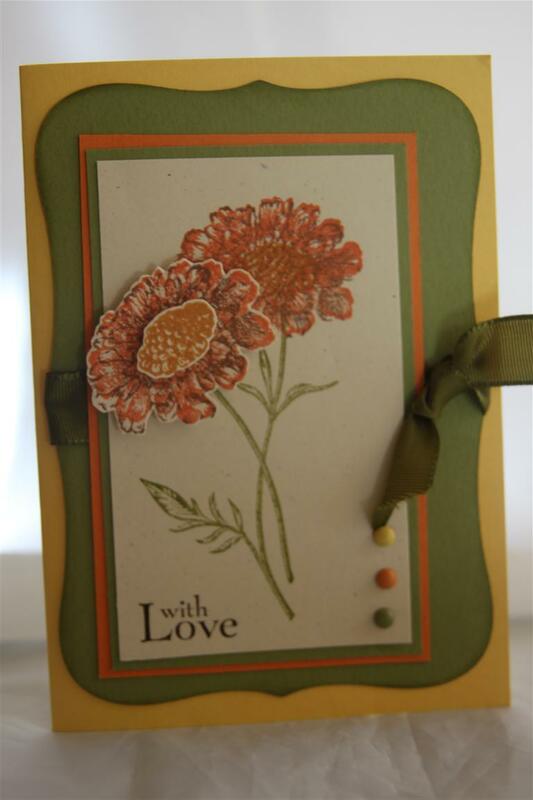 The inks used were stampin up tangerine tango, more mustard, and old olive, and the cardstock was also stampin up daffodil yellow, tangerine tango and old olive. I just added 3 brads and some ribbon. Its been another very hot day here in Adelaide, and I have been out celebrating Dads 80th birthday with Mum, dad and my 2 sisters. Have eaten far too much and now have to face the kitchen to feed the blokes here who didn’t come out with us!May or may not visit the craft room tonight – it depends whether it cools down a bit…. Til tomorrow…. 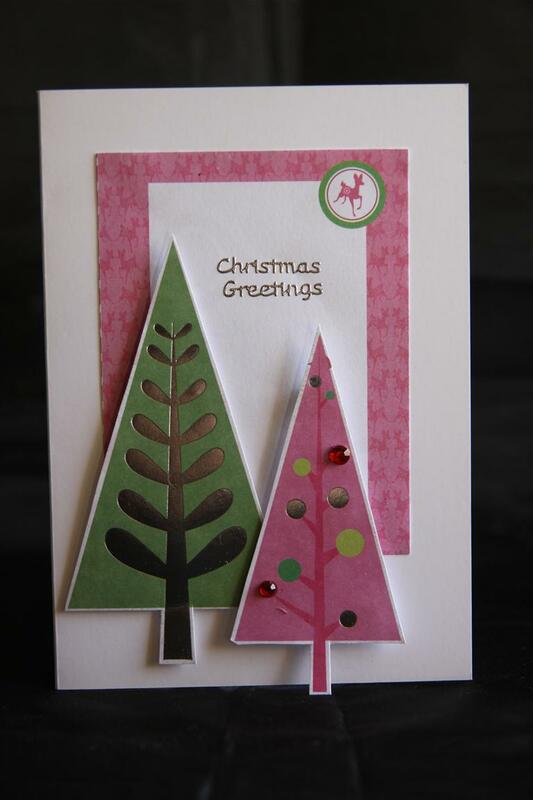 As promised this is the card I made over at Mums yesterday when I had limited bits and pieces with me. Kay and Mum both told me this card was great as it was when my instinct would have been to bling it up a little .What do you think? The whole experience has made me question whether I use too much product on my cards?Maybe I just can’t do clean and simple! The papers used here are kaisercraft Silly season.Apologies for yesterdays blog, I have just noticed that I posted the same group of cards twice. Lets call it a technical difficulty!I have had great fun this weekend using my new paper collections which you will see over the coming days. Til tomorrow…..